At least a further nine people have been killed in another attack by suspected Islamist militants in the eastern extremes of the Democratic Republic of the Congo, bringing the total killed in the past week to nearly 50. World Watch Monitor reported last week that between 20 and 40 villagers had been killed in an attack late in the evening on 3 May in a village in North Kivu province. 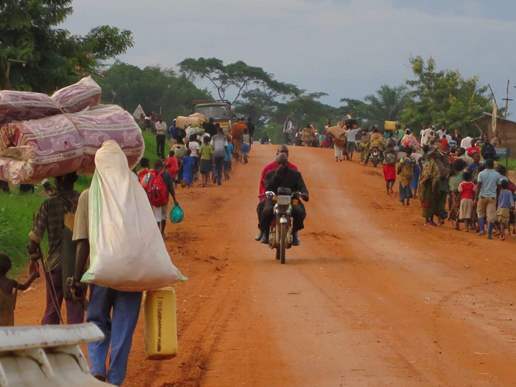 Another attack late on 6 May in the province of Ituri, slightly further north, saw between nine and 15 killed, including the worship leader and deaconess of a local church. They were part of the mission organisation Eglise du Rocher, or Church on the Rock, which also lost a pastor and his wife to an attack in October 2014 in Cadeau. That church, and the school attached to it, have yet to reopen. The church has also since abandoned its mission amongst Mbuti Pygmies. The deaconess, Éva Makanaiye, 40, leaves behind five children: Eva-Mamulu, 12; Alima-Franchine, 9; Sami-Sumbuka, 7; Unamosi-Jouele, 4; and Amali-Daniel, 2. The worship leader, identified only by her first name, Rose, also leaves behind five children. “Our pastor ran away with two of his children. The whole night he did not know where his wife was, or his three other children. People spent the night in the jungle under heavy rain. This morning our pastor came back and found his wife and children all alive. Praise God!” Anticoli said. We are heartbroken, questioning our faith, half-terrified, but determined, and carrying on. The attack on 6 May lasted just 45 minutes, before the attackers fled to hide in the bush, a local source told World Watch Monitor. Locals expressed anger at the failure of nearby armed forces to intervene. The attack took place just 300 metres away from a Congolese army base and 500 metres from a UN army base. Locals said they had earlier alerted soldiers about “suspicious movements” nearby. A spokesman from the Congolese army said they had not been able to intervene because the attack took place at night and was over quickly. Locals are blaming the attack on Muslim Defense International, formerly known as the Alliance of Democratic Forces, but the group has not yet claimed responsibility. MDI, a 20-year-old alliance of Ugandan militants, was first linked with former Ugandan dictator Idi Amin. It has long been active in the eastern regions of neighbouring DR Congo, and is responsible for the deaths of hundreds of civilians since 2014, according to the UN. MDI has repeatedly attacked the majority-Christian population in eastern DRC for years. Kidnapping and murder are common. It is alleged to have support from the Islamic government of Sudan, an assertion made by the Uganda government and backed by Western diplomatic sources. The group is accused of waging a proxy war for Sudan against Uganda as retribution for Uganda’s support of secessionists who broke away to form the nation of South Sudan in 2011. MDI is known to have attracted foreign recruits and to have forced Christians to convert to Islam. The local population in the related area is overwhelmingly Christian (95.8%) and the impact on them has been immense. After the 3 May attack, World Watch Monitor heard from a pastor in the area, who said the people are terrified but that while some contemplated fleeing again, others have opted to stay in the hope that things will return to normal. In a letter released a year ago, the Bishops of the Province of Bukavu in eastern DR Congo denounced a “climate of genocide” and the passivity of the Congolese State and international community. Omar Kavota, Chief Executive of the Study Centre for the Promotion of Peace, Democracy and Human Rights told Radio Okapi the international community must intervene. Some graphic images emerged after the 3 May attack, showing the bodies of the women and children killed. Eight women – two of them pregnant – and four children died, according to official figures. “I saw pregnant women and children slaughtered!” one local said.